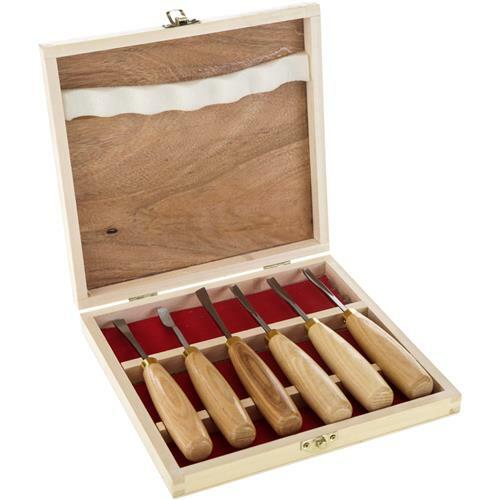 Beautiful Manchurian ash handles accent these chisels with tough, chrome vanadium steel blades. Blades are hardened to Rockwell 40 hardness and read for use. 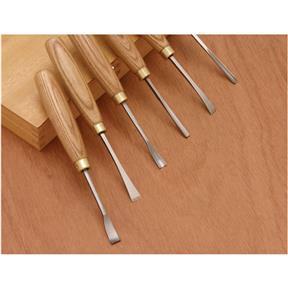 Handles measure 4-1/4" long & chisels measure 7" long overall. Set includes: #8 sweep 5mm gouge, #8 sweep 8mm spoon gouge, #13 sweep 4mm V-parting gouge, #1 sweep 9mm right skewed spoon gouge, #1 sweep 9mm fishtail spoon gouge, #1 sweep 12mm fishtail gouge, and wooden box.